In the remind me window you can look back in time and see what you did on a particular day. 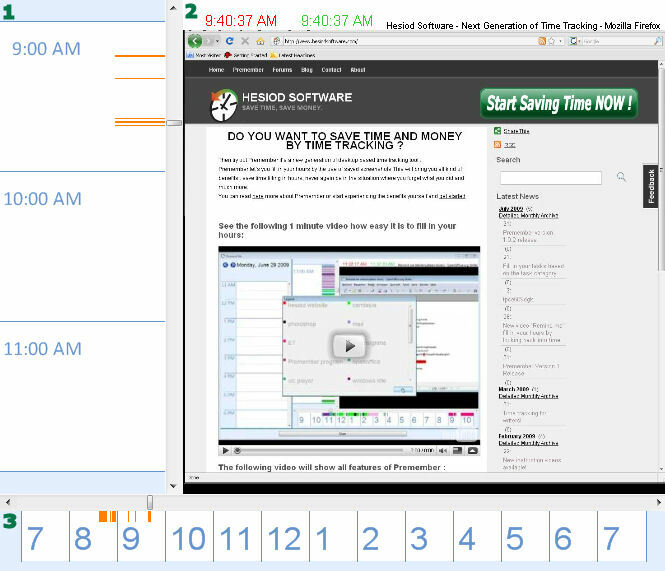 The remind window consist of 2 parts the day calendar and the “remind me part ”. Here you can work with tasks. The part that let you look what you did on that particular day. In the Remind me window there is a Calendar where you can add, move, change and delete tasks. The horizontal bar shows the hours. To start working with tasks you must first have at least one Project and Task Category, these can be configured in the Main Configuration in the Project tab. You can insert a task by right clicking on the desired time and day where you want to add the task and click add in the popup menu. You can delete a task by right clicking on a task and then select the delete option. You can change the properties of a task by right clicking on a task and then select the edit option. A task can be copied by dragging and keeping the “ctrl” button pressed. You can move a task by clicking on a task and dragging to the desired position. You can resize a task by clicking on the start or end of a task and dragging it to the desired size. Tasks can be automatic added to the week calendar when there is atleast one filter configured for automatic tasks. The tasks can be added by right clicking inside the week calendar and then clicking on the “Auto add tasks” option inside the popup menu. The remind part of the remind me is the place where you can look back in time. Here are a limited amount of hours of the day shown. When screenshot filters are configured you can see here in different colors when a particular windows was active. This is the place where the screenshot is shown at the time that is selected in the vertical hourbar or horizontal hourbar. 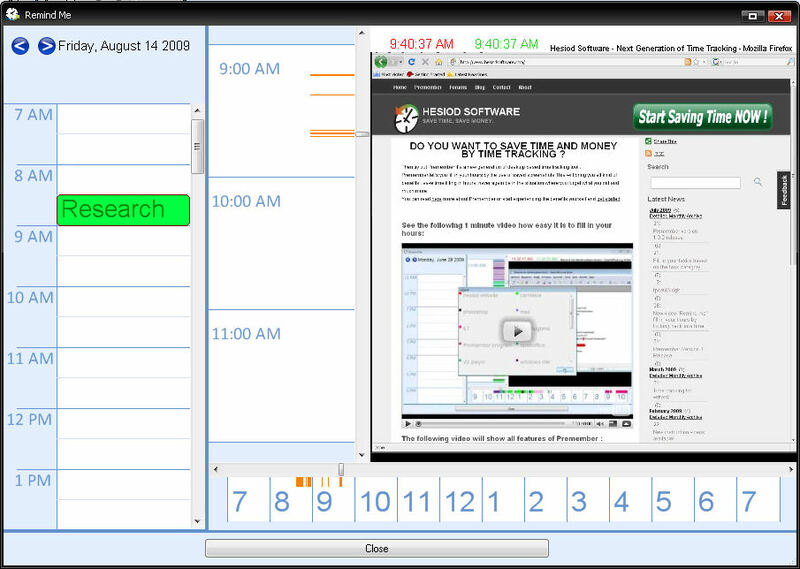 Above the image the following items are shown; the current time of this screenshot in red, the selected time in green and the title of the window. You can zoom in on a screenshot by holding down the left mouse button and selecting the area where you want to zoom in. By clicking with the right mouse button on the image you will zoom out again. Here the whole day is shown. When screenshot filters are configured you can see here in different colors when a particular window was active. Select the previous screenshot image. Select the next screenshot image.